Sanctioned Psycher who is the queen in absentia of the agri-planet Arendelle. After the events of the movie an Inquisitor (hopefully another PC) came to the planet and recruited her to their retinue. She put her sister in charge when she left with the planet. This will allow her to work from a place she's familiar with and will hopefully make her feel comfortable. I'm slightly stuck on her powers. At this point I'm thinking just flipping the fire powers to be cold powers. Ultimate effects unchanged, just how they manifest. What I'm hoping is someone has actually done cold based psycher powers and can point me to to them. 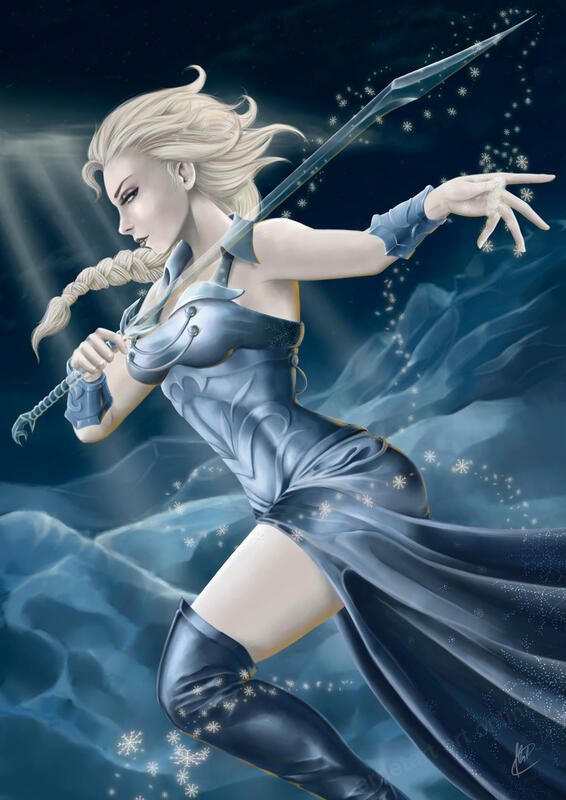 I'm also open to suggestions as to better ways of accomplishing Elsa for her if people have such suggestions. You may want to look at Voidfrost discipline from Rogue Trader "The Navis Primer" book. And it should not be too difficult to transform Pyromancy discipline to Cryomancy. Keep treshold, focus time and other numerical parameters, just change visual representation and don't forget that heat and cold immunity/resistance are two different things. Thanks for the heads up about Voidfrost. It's cool, but not quite what I'm looking for. It more and more feels like simply flipping the heat to cold powers is the way to go. I will give her cold resistance, since to quote Elsa: "The cold never bothered me anyway." Stop right there, why would you traumatize your child with GrimDarks™????? I was thinking something along the same lines...well, not quite so dire, but I am curious. How will you present the grimdark future of body-mutating mind **** and endless (justified) witch burnings to her? Like you know, anything else that exists and isn't good that kids know that exist. At this age, we all know that injustice, war and bad things exist. You just don't need to show her the great variations, you depict it more in black and white, with less grey area (and those that exist are quite clear and understandable), and you don't put too much details in the most violent aspect of the setting. Knowing that an enemy was dismembered by an other enemy is enough. Remember, in the end, that at this age, the kid will make his own images, so no need to be too precise, let him imagine. Have you ever really watched some Disney movies? They do get REALLY dark. Pretty much everyone's parents die - for example: Bambi's mom is shot in the beginning, the evil stepsisters are really heinous and Cinderella's parents are dead, the voodoo priest practices blood magic, worships demons and kills a major character. Even in Frozen, the parents die and Elsa is responsible for nearly killing her sister. I'll grant you my little girl hasn't seemed to pick up on these things, but she does REALLY like Frankenstein, even to the point of listening to the original text by Mary Wollstonecraft. She's also listened to a lot of Black Library 40k stories with my son and I, so she has some actual familiarity with the universe. Still, the grim dark is of concern. I'm writing the first adventure, so I'll be glossing over the darkest parts of the universe & making it pretty straight forward. If they stick with, I can introduce more and more darkness as they age. That's a helluva job you've got there. IoM is famously racist/cruel and outright disturbing. Still, playing RPG's is one of the best hobbies for young people, so I'm keeping my fingers crossed. Are you going to make it challenging for her (i.e her character is not immortal), or are you going to run it safe? Good luck with your effort!